We are 16 CFR 1633 Certified! Learn more about our beginnings: personal and business. Available at Barnes and Nobel and all major bookstores. Who gets up in the morning smiling? Because each row of springs is formed from a single continuous length of high performance wire providing a superior, more supportive sleep surface. 49% more surface coverage than most common type of units. The result is greater support, plus resilience to equalize body pressure points and reduce sleeping partner disturbance. The continuous coil allows the body to maintain it's correct postural alignment in any position. 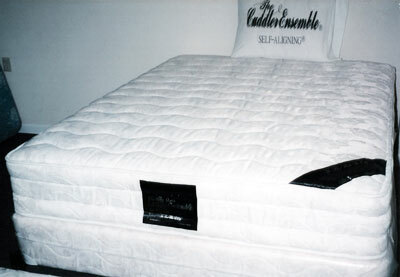 The combination of this mattress with the "self-aligning" foundation, makes a very stabilized and comfortable set.